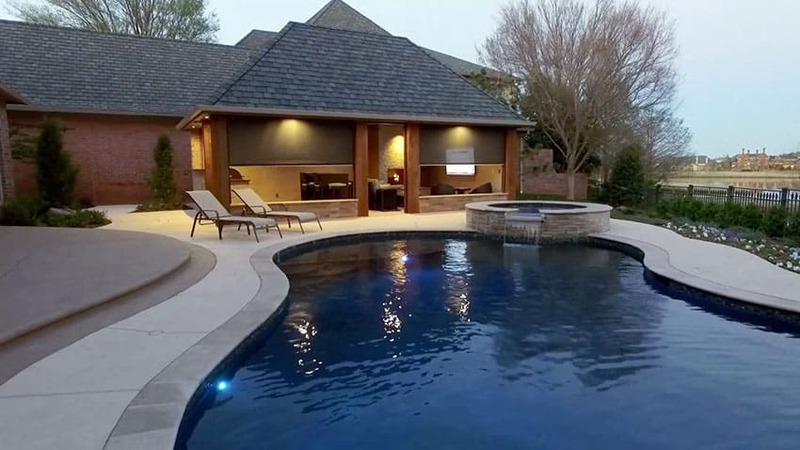 This luxury home’s backyard has an impressive swimming pool cabana design with outdoor kitchen. The pool itself features a free form courtyard pool with gorgeous travertine pool coping, an elevated hot tub, midnight blue plaster and a rock waterfall. The patio surrounding the pool provides plenty of room for lounge chairs and is enhanced by the well landscaped garden area. 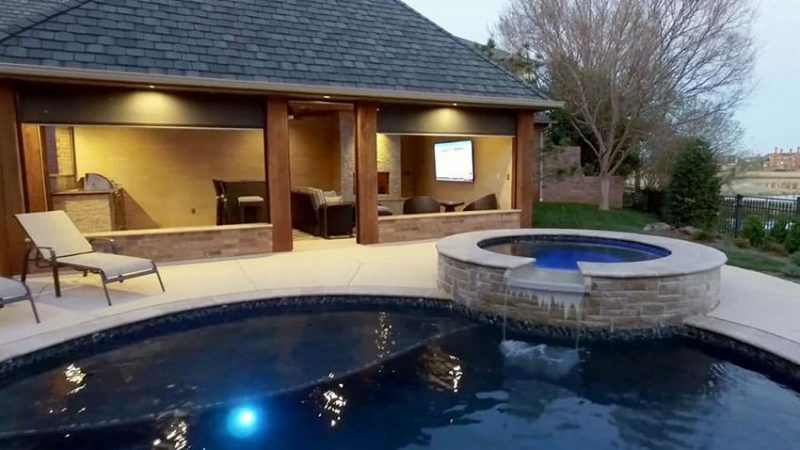 The pool cabana measures 17’x25′ in length. 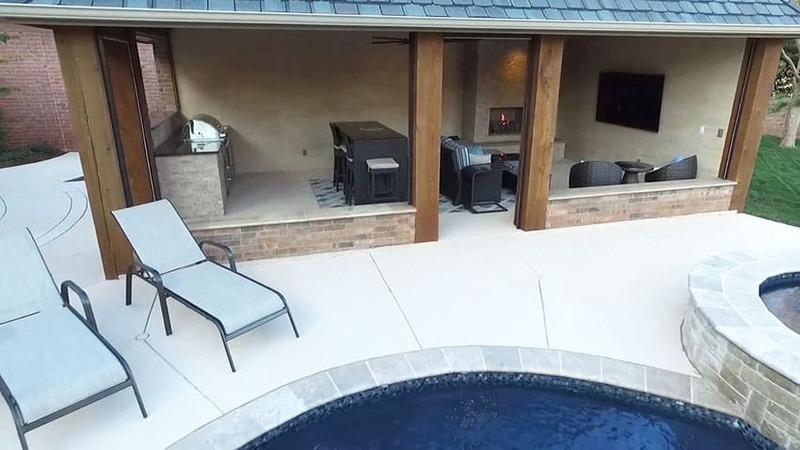 The luxury outdoor living space comes equipped with advanced roll down shades, a gas fireplace, outdoor kitchen with grill, and television . The cabana is constructed with a wood frame, with brick & tile walls and a shingle roof. There are a variety of opportunities to sit and relax from the synthetic rattan dining table, modern love seat, or home bar area. The outdoor kitchen has a granite counter top with under cabinet storage and stainless steel grill. The elegant fireplace is constructed with split face porcelain Noche travertine tile and the walls are decorated with 1’x1′ Noche tile. The light beige earth tones with coffee undertones of the Noche tile looks impressive and matches well with the overall design aesthetic. For the deck coating of the cabana floor as well as the pool a coating of Americote in the shade of Tea & Cream was used. 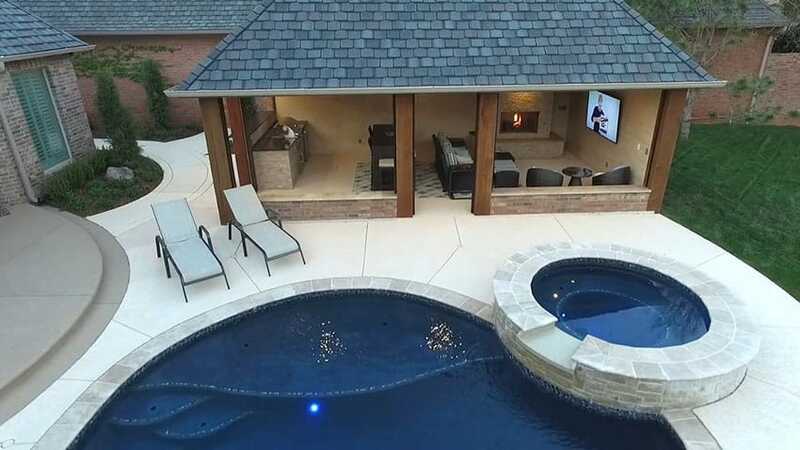 From this picture you can see the layout of the swimming pool design and the patio leading from the back exit of the home. 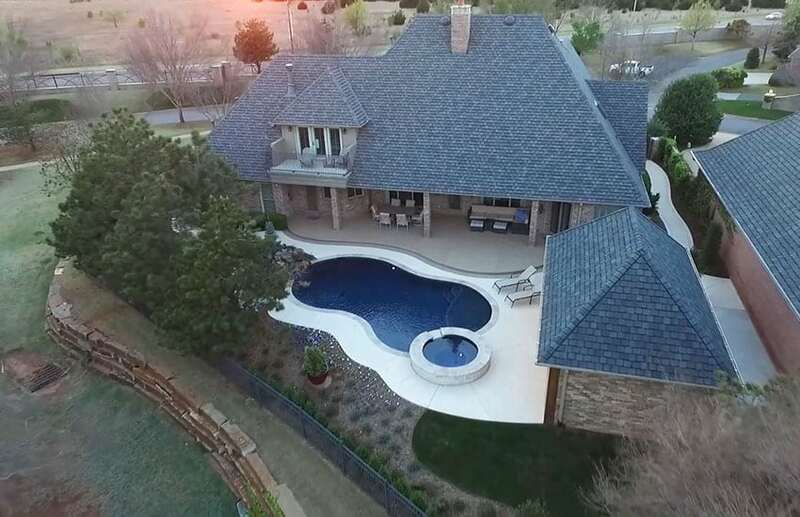 From an aerial view of the home’s backyard one can see the contoured steps of the pool and close proximity to the cabana. 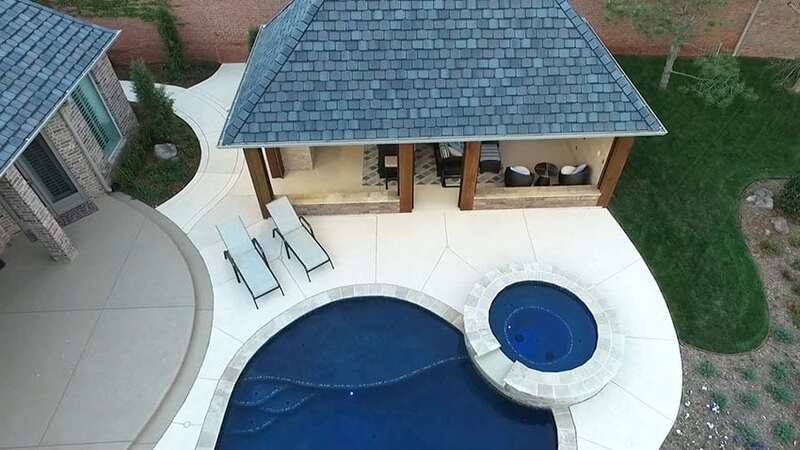 The cabana’s roof and design was carefully created to match the exact style of the home. From this vantage point one can see the back of the home with its covered patio as well as the second story balcony with wrought iron railing. 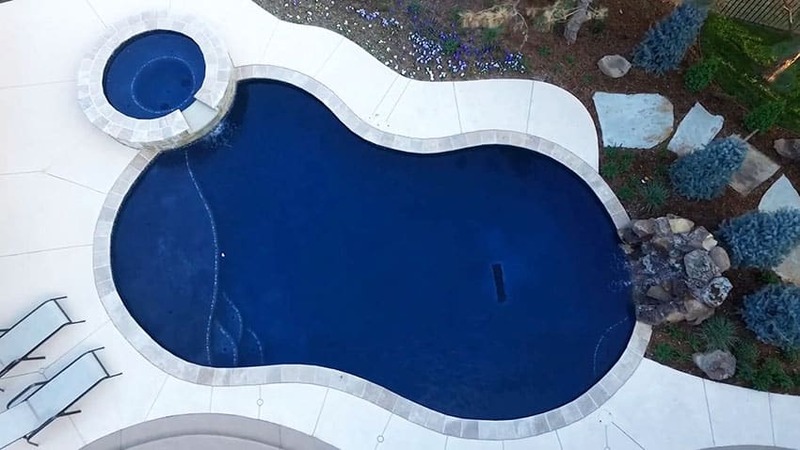 A top down view of the swimming pool with water feature. The natural rock water feature resembles a real flowing stream with waterfall and greatly enhances the ambiance of the pool area. Looking toward the back of the house one gets another vantage point of the swimming pool with rockfall water feature. The home offers a large back patio with stylish Americote sealed concrete coating. The large outdoor sectional couch and dining table makes it an appealing place to entertain and enjoy outdoor living. In this image the pool cabana’s advanced roll down shades are activated and slowly dropping to provide protection from the sun, wind and rain. Motorized shades are stylish, easy to control at the touch of a button and provide excellent light control. A close-up view of the outdoor kitchen cabana design with swimming pool and spa. 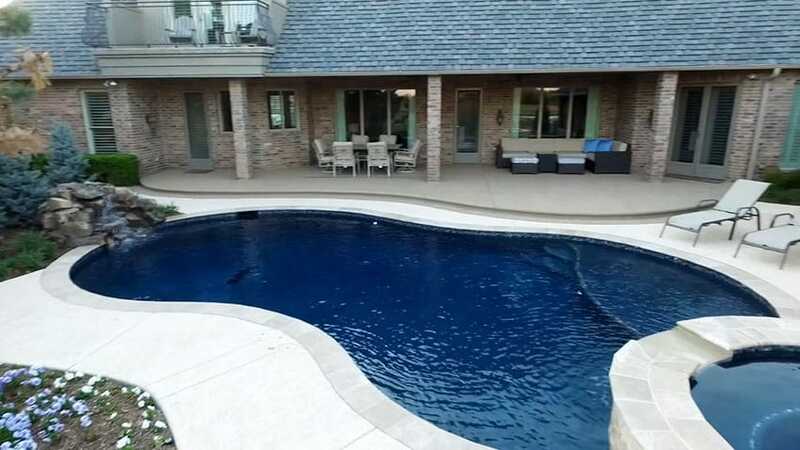 This home is perfect for entertaining with multiple areas for sitting as well as socializing. 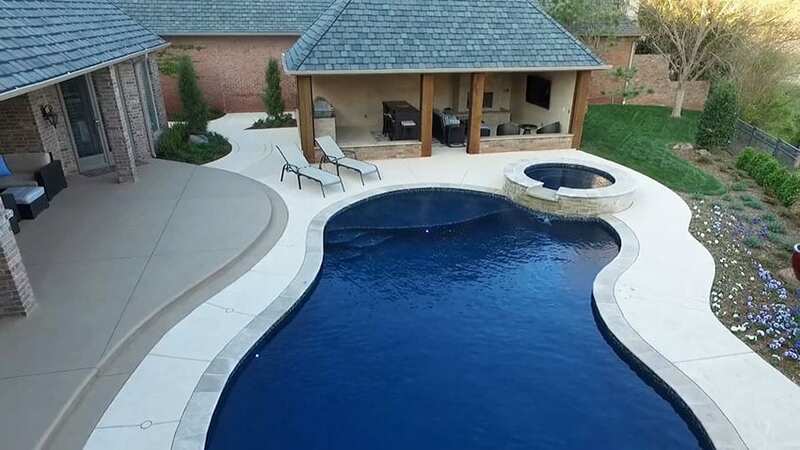 The elevated hot tub has a water spillway to provide a calming waterflow in to the pool. Recessed lighting in the ceiling of the structure as well as several blue tinted pool lights provides an attractive night time ambiance. With all the beauty and amenities this home offers, visitors are sure to enjoy a vacation getaway right from their own backyard.